Parking brings us back to the common (well understood) ground. 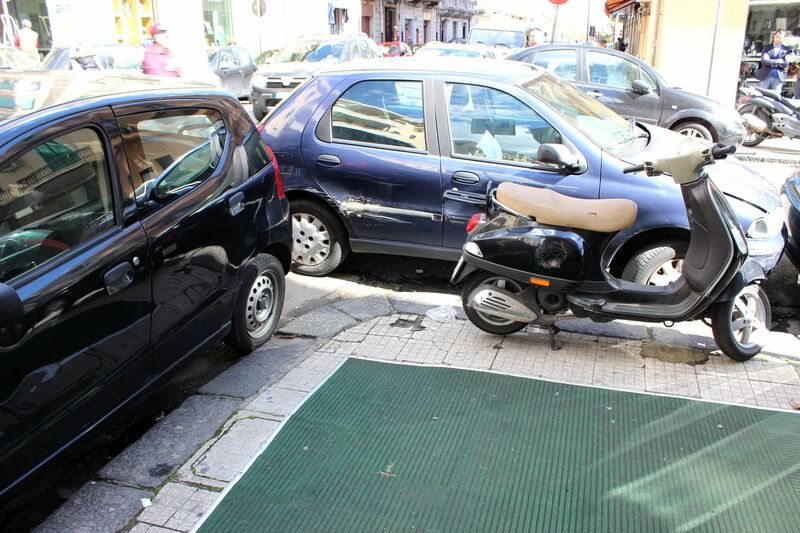 So here is what to expect in “general access” areas like streets, squares (piazzas)…. 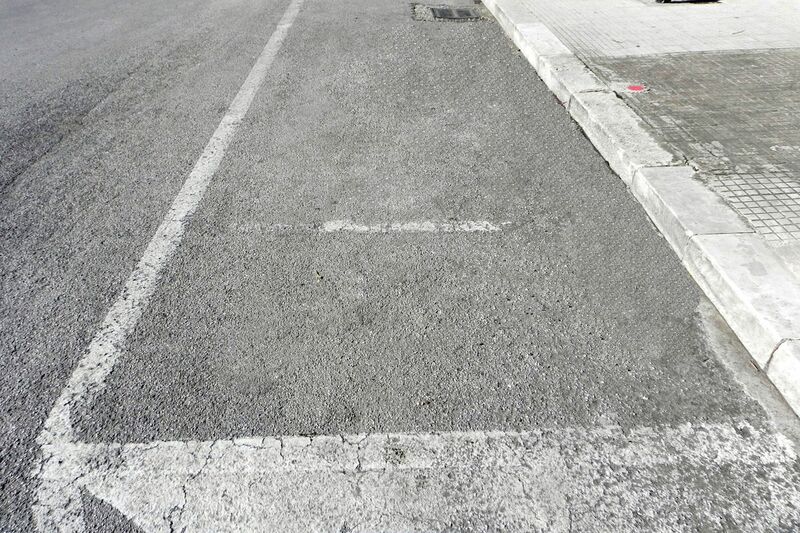 White: Parking places marked by white lines are free of charge. 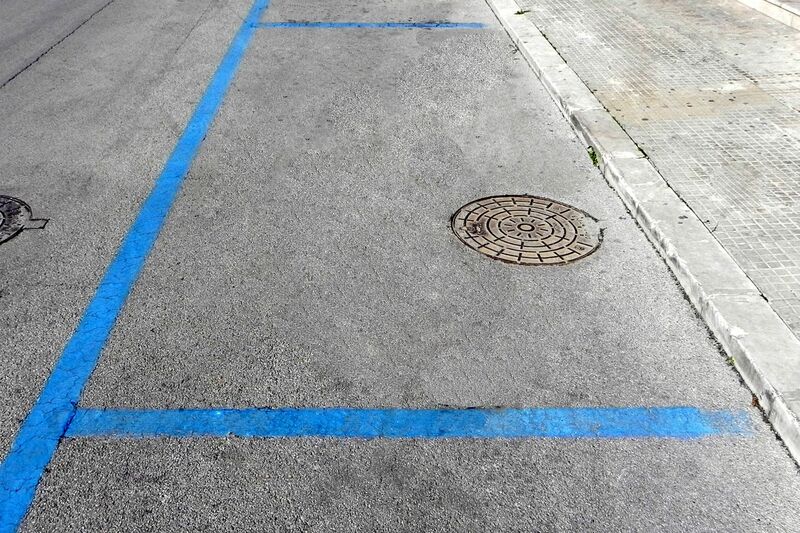 Blue: Parking places marked by blue lines have fees. 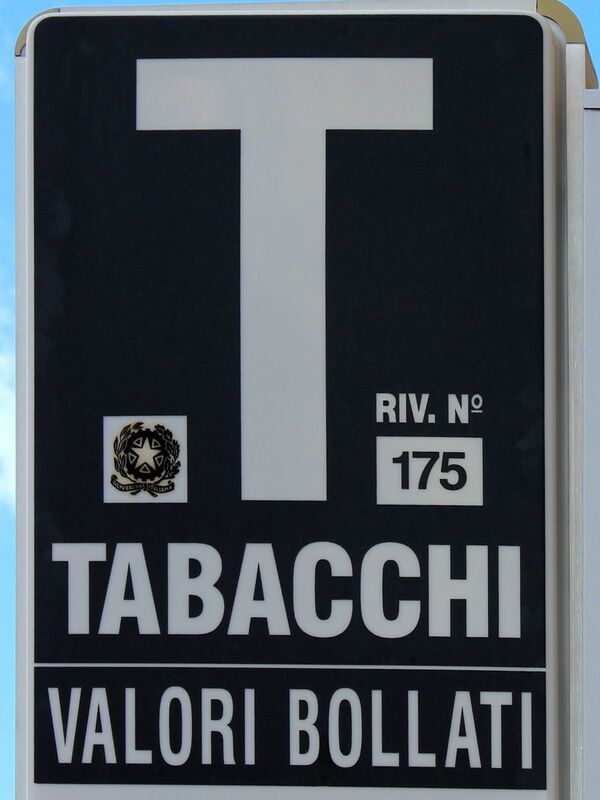 Depending on the city, you can either buy the parking ticket (scheda di parcheggio) at the ticket machine (Parcometro) or at nearby Tabacco Shop ( Tabacchi). 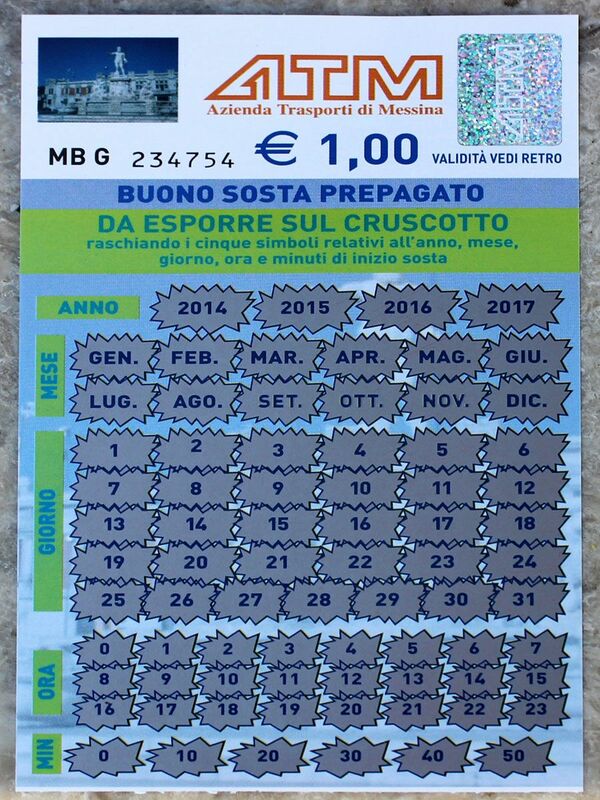 The first is just the printed record of parking fees with time limit, the latter one is a sort of “scratch-off”–type thing, similar to popular lottery tickets and has specified time (usually 1 hour, so if you need longer time you have to buy few). You scratch the date and time and leave the tickets on your dashboard. 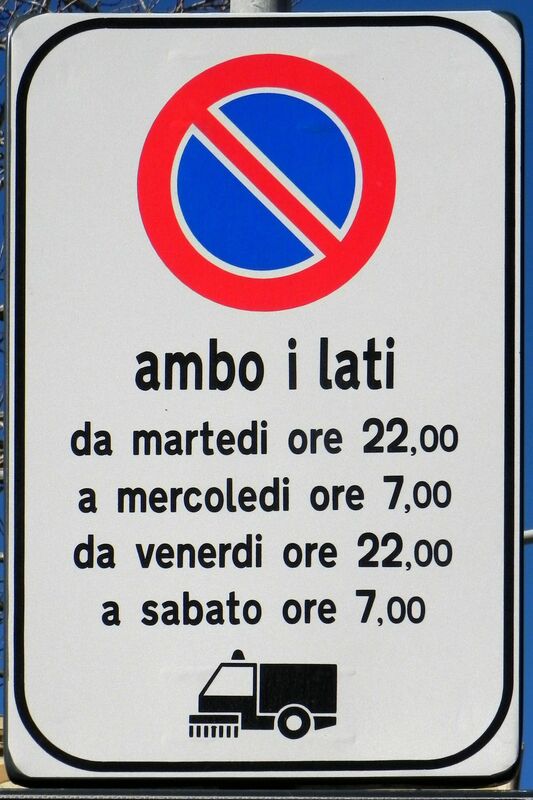 Parking fees range from 0.8€ to 2.5€ per hour (typically 1€). Usually fees are mandatory only during certain time during a day. Typically it will be from 9am-to-12am and then from 3pm–till-8pm (siesta is a “sacred” time). For this one you will have to pay! 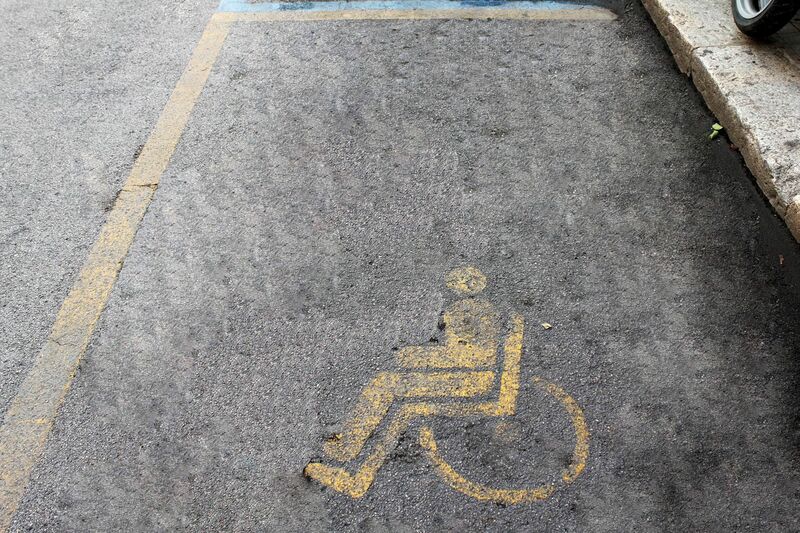 Yellow: Parking places marked by yellow lines are reserved for loading/unloading merchandise (so usually you will find them in front of shops) as well as for handicapped drivers. 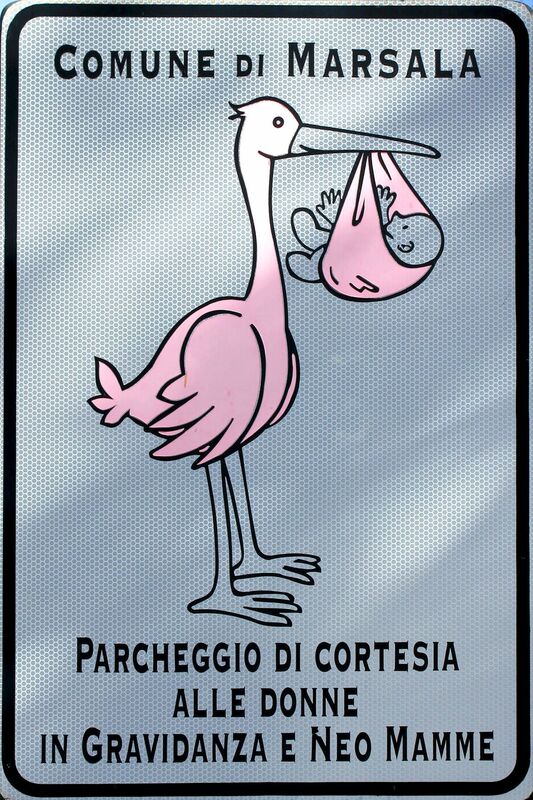 In the latter case corresponding signs will be either painted on the street or displayed next to the parking slot. 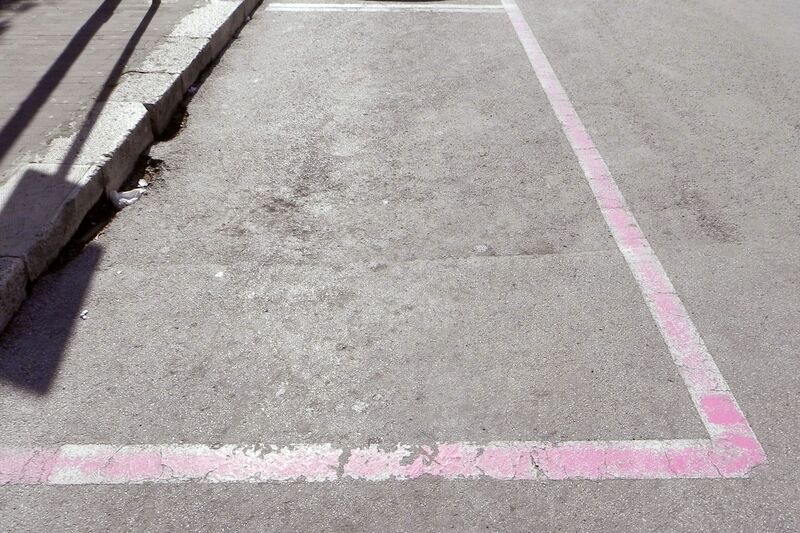 Pink: Parking places marked by pink lines are reserved for pregnant drivers and mothers with babies. That is actually very cute idea. These parking slots (areas) allow for limited time parking. Many local drivers have attached to the windshield a “Blue Disk” (kind of clock’s face) where they can display the time of arrival. But do not worry – you can use a piece of paper where you write the time of arrival leaving it on the dashboard). It will do the job, provided you do not leave your car for longer than permitted. 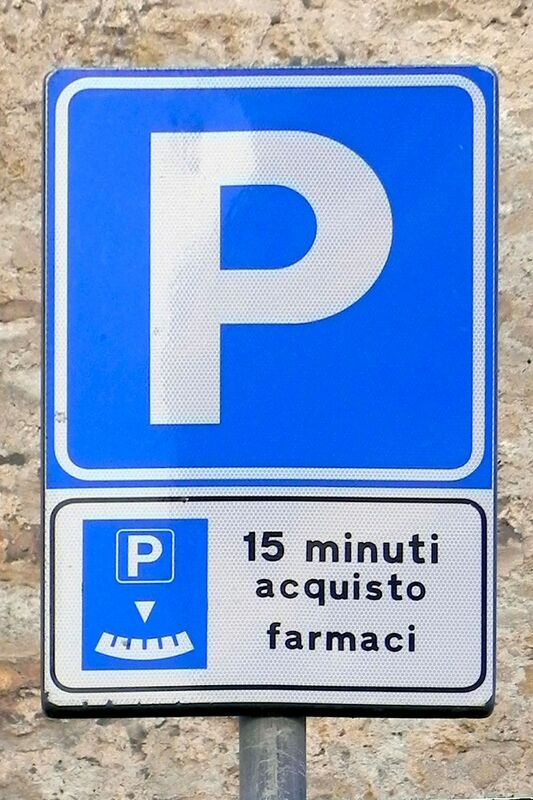 Usually, you will find such “limited-time” parking slots in front of pharmacies, in town centers (with parking zones) and in front of big shops. The goal is obvious – to keep some parking places available for “short-term” customers. They can be either white (free, but for limited time) or blue (paid). 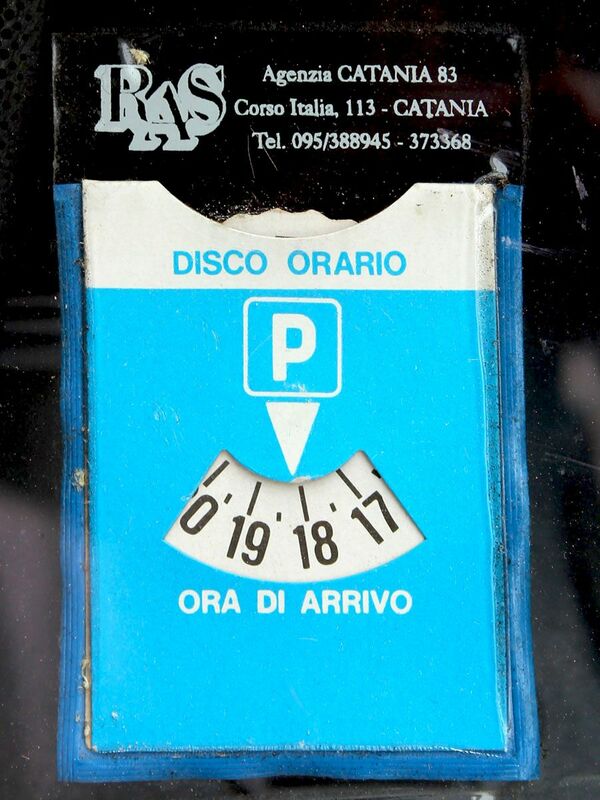 In some Sicilian cities (for example Marsala) all mentioned parking areas (white, blue, yellow) are valid based on odd/even days to allow for cleaning of the streets. You have to watch the signs! 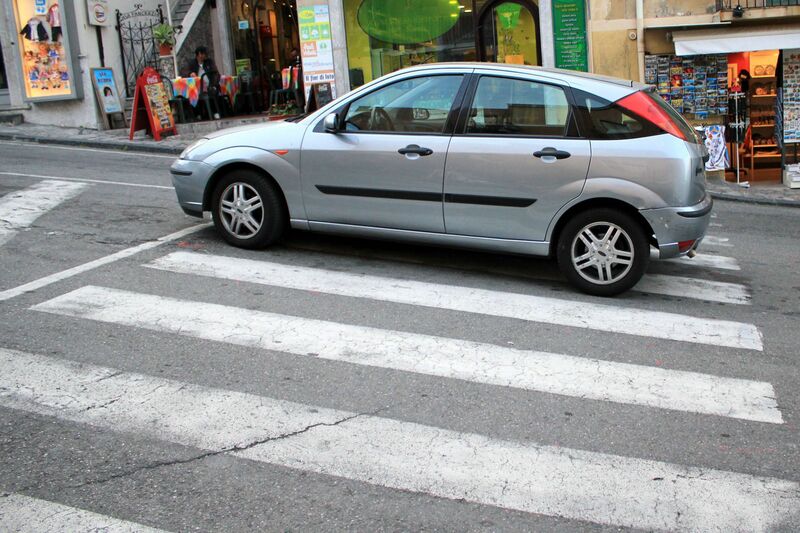 In big cities, in free parking zones you will find so-called “Car Parkers” (Posteggiatori). They will pretend to be rulers of the parking, making it clear that they deserve some “gratification” for their services. 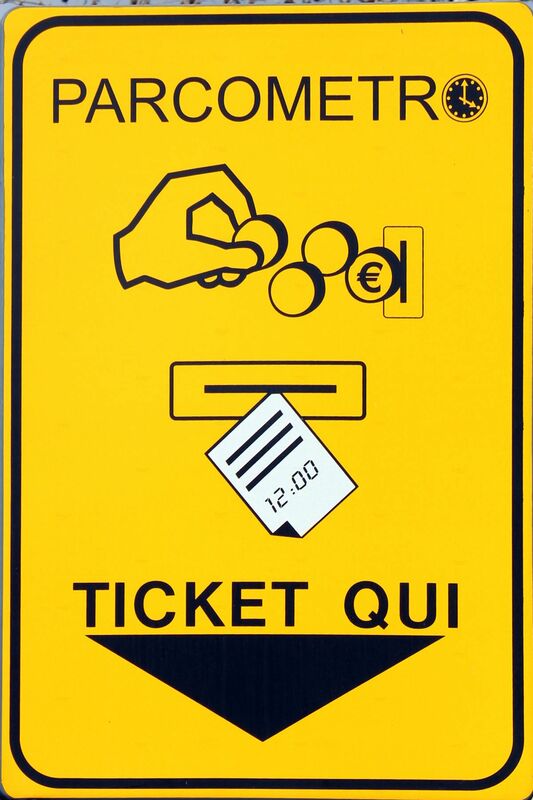 This is illegal, but hey, at the cost of 1€ you gain a peace of mind and enjoy your journey. It is not that they will protect your car from potential parking scratches, damage or even theft. 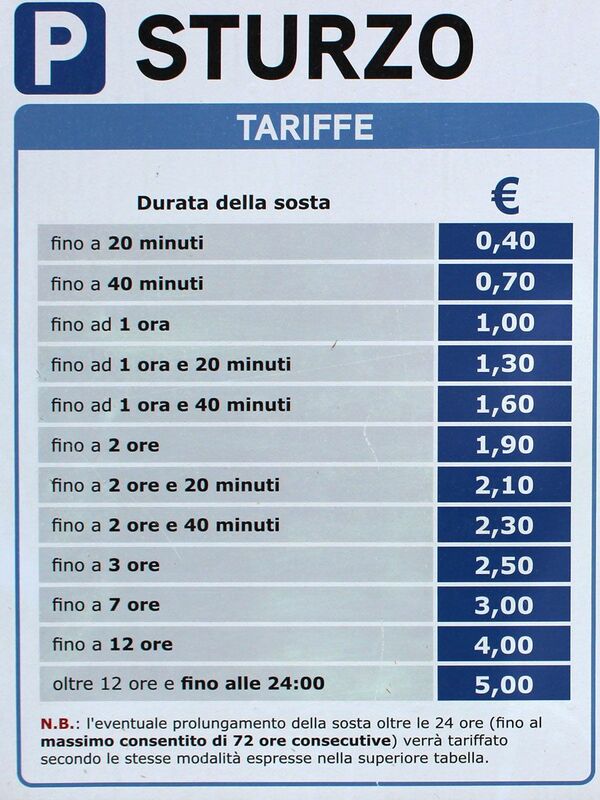 This little 1€ is rather an extra “protection” that they will not do it themselves to show you who is the boss. Do not look for another parking place, most likely a similar-looking “little guy” will be waiting there for you! So dig-out the coin from your pocket, hand it to the guy and forget the whole story! OK, so this one shows that from Tuesday 22pm till Wednesday 7am and from Friday 22pm till Saturday 7 am the city is cleaning this street so regardless the parking zone, you have to remove your car. OK, these rules are simple, clear and convincing. It doesn’t mean however that they are always respected. Although usually it is wise to blend with local environment and learn from habits of local drivers, it is not always the best idea to follow them blindly. I know, it is hard to believe, but believe me, this driver is not waiting on red light, he just parked the car on the "zebra" and left! Do not follow such examples!